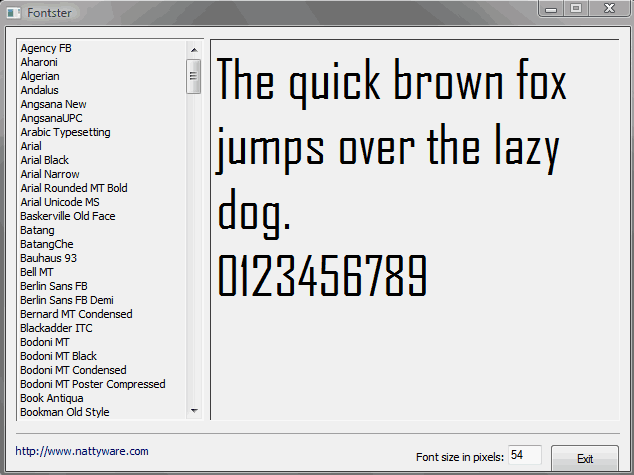 Fontster is a lightweight and simple font viewer. How to extract: Download Fonster.hta to a folder of your choice and launch. I agree with Midas on this one. I just want a "viewer" and this one does exactly what I need it to do. When I want to review and select a font for a project, this one is quick and simple to use. I recently tried NexusFont and didn't like all the unnecessary functions and the clunky GUI. This one works for me. Sorry to disagree with you, Midas, but I found this font viewer to be one of the most elementary and nearly worthless that I have ever seen. There are dozens and dozens of free font viewers out there and virtually all of them are better than this one. I just hope this one got the sixth grade student a passing grade in Introduction to Computer Programming.